Desperate for a good night’s sleep? Want to soothe your baby and stop the crying, but unsure how? Consider a swaddle. This near-universal practice, which has been in existence for centuries, involves firmly wrapping your newborn with a lightweight blanket in order to create a secure, comfortable cocoon. Though this technique has gone in and out of fashion over the years, many sleep experts now recommend swaddling to help calm a fussy, over-stimulated infant. 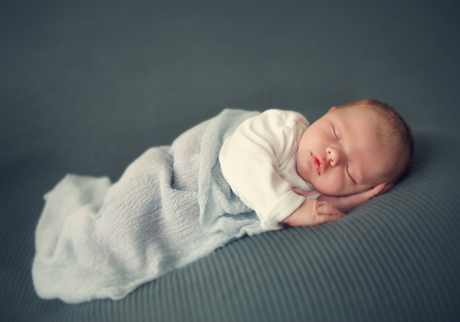 “Swaddling provides the secure, comforting feeling that your baby had while in the womb,” explains Arianna Birnbaum a Toronto-based sleep consultant and co-owner of Becoming Maternity and Parenting Centres. “It also limits the newborn’s startle reflex.” She explains that many new babies will be sound asleep and then suddenly extend their arms, startling themselves awake. This can be extremely disruptive and can make longer stretches of sleep nearly impossible. With the baby’s arms tucked inside a swaddle, they have less chance of startling and will likely stay asleep longer. Birnbaum, who helps new parents teach their babies how to sleep, recommends her clients choose a pre-made swaddle blanket, which is often easier to wrap. There are a variety of brands available; some include Velcro, which can be noisy or may not fit tightly, while others involve wrapping and tucking. The swaddle blanket should also be made from a light, breathable material. If you can perfect the technique on your own, a light square receiving blanket will do the trick. Swaddling helps babies sleep better on their backs, which is a recommended practice for SIDS prevention. Once a child learns to flip from her back to her front, parents may want to consider switching away from the swaddle to a sleep sack.